The third Monday of February is Family Day here in Ontario, Canada. A quick look at Wikipedia tells me that the same is true in the Canadian provinces of Alberta, Manitoba, Nova Scotia, Prince Edward Island (PEI) and Saskatchewan. It also coincides with Presidents' Day in the US. In Manitoba, Nova Scotia and PEI, the holiday is called Louis Riel Day, Nova Scotia Heritage Day and Islander Day, respectively. British Columbia (BC) observes Family Day on the second Monday of February. As it's not a federal holiday, not everyone actually gets this day off of work. But for those of us who do, the term "Family Day" kind of implies we should do something family-ish, right? Seeing as it's still very much winter here in February, you could possibly head out for a day of skiing, snowshoeing or sledding. But if you're more of a fan of indoor pursuits (like this cold-sensitive gal here), why not do some crafting together as a family? 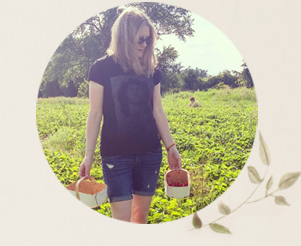 For inspiration, I've rounded up family craft ideas and projects for all different ages from some of my favourite bloggers. I've also included a few things you can bake, because you surely need something to munch on when you're doing all that crafting! Some of my favourite crafts are those that use felt. Head over to Sustain My Craft Habit to see how to make these Super Silly Minion-Like Finger Puppets. 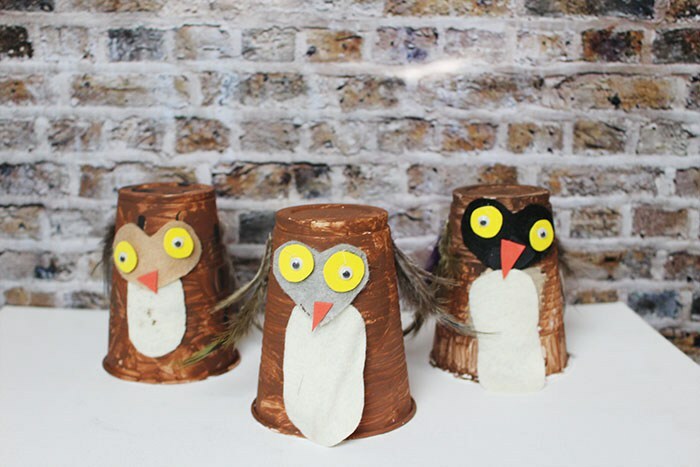 Not only are they adorable and fun for kids, but you can also use up your felt scraps! A template is included. Are you all about getting organized right now? Then Jane and Sonja's unique pencil case will help you to corral your kids' writing implements. Make an upcycled pencil case using duck tape! Also from the talented gals at Sustain My Craft Habit, find out how to make cookie cutter clay magnets using baking soda. Ariel from PMQ For Two shows you how to recreate Pottery Barn's marbleized serving platter. 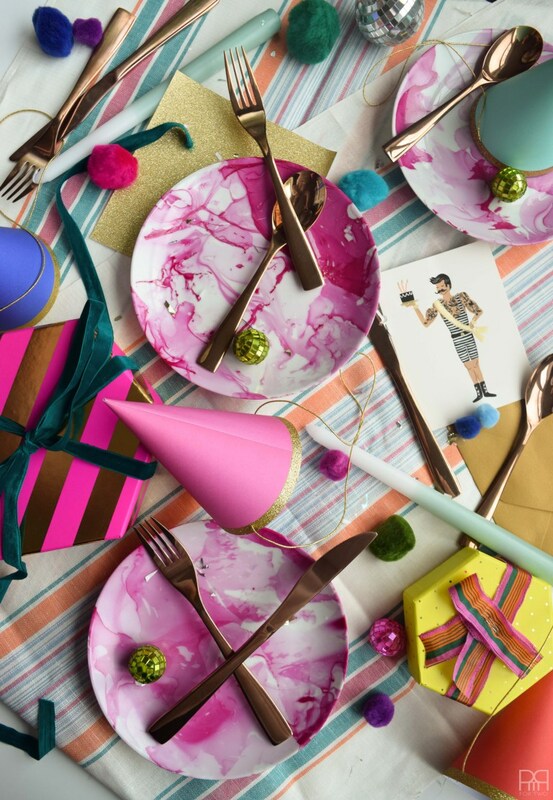 Her pink marbleized plates are so pretty and festive and make a great craft project for a preteen or teen (as you may not want the smaller kiddos messing with your nail polish). Ariel also has this fab idea for glam eggs using plastic gemstones. Why not get a head start on your Easter decor now? And using plastic eggs means this craft is not only vegan-friendly, but also lasts indefinitely. Merry from Merry About Town shows you how to make easy homemade window clings. These are so simple and cute. I know my daughter would love to do this craft. Anything with glue gets top marks from her. Amanda and her daughter took a sewing class together. Her new knowledge inspired this Multi-Testing Mommy to make these easy diy microwavable beanbags that can also be used cold to treat injuries. Use your beanbag warm to snuggle up with on cold winter nights! Brooke has some fab ideas for getting artsy with the kiddos, like adorable paper plate animals and super cute plastic cup owls. Bonnie from The Koala Mom has great, low-cost ideas for sewing simple doll clothes from felt. There's even a sleeping bag for your little one's fave stuffed toy! My daughter loves to make spa-worthy items like bath bombs and bath salts. Bonnie shows us how to make lovely scented lavender bath salts. 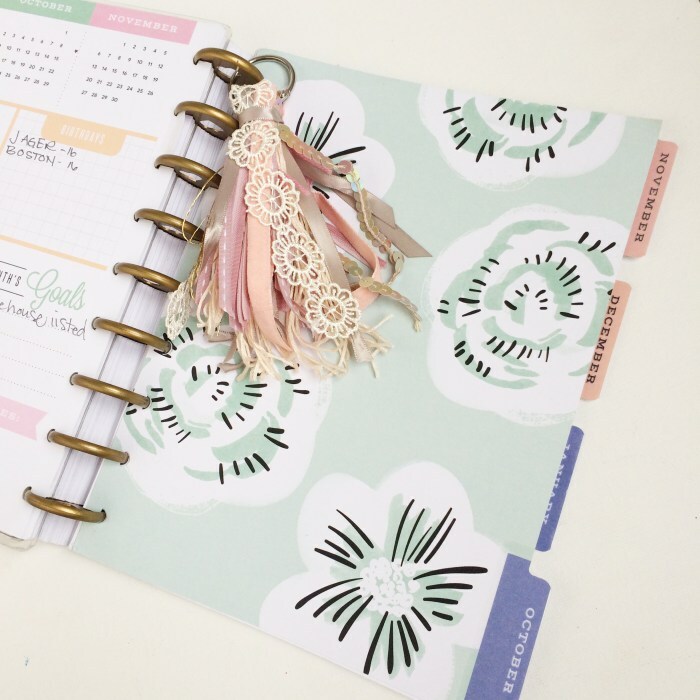 Working with an older child, you can make one of these ribbon tassel keychains from Brooklyn Berry Designs for each of you, ie. it's a fun diy for Mom too! It's a great craft for using up crafting leftovers - Brooke used things like lace, sequins and ribbons. The Koala Mom has this great idea to jazz up your reusable canvas tote bags. Your kids can go to town personalizing their own bags in their own unique ways. If you have a budding knitter in the family, this diy yarn garland calls for a simple knit stitch. It's super easy but ends up looking great. Your new knitter can proudly put it on display in the house. 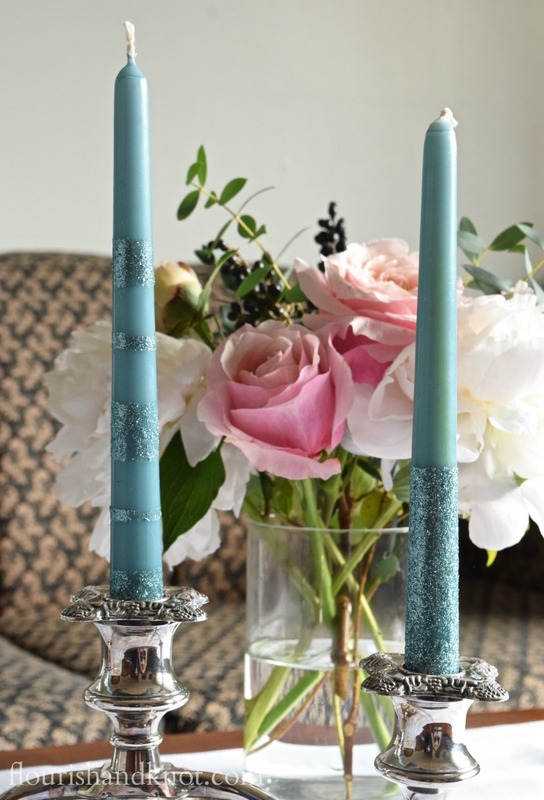 Do it in a colour scheme to suit a party or decor theme. 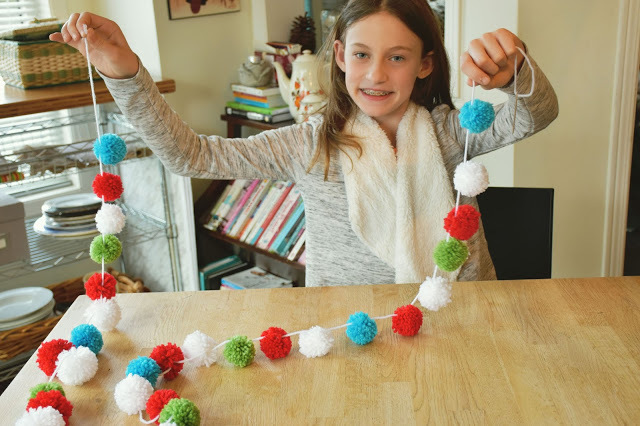 Making a pom pom garland is a great family project. Everybody can get involved with crafting the pom poms - you'll need a lot of them - and stringing them on yarn or twine. Make it for a birthday party, for Canada Day or just for your everyday decor. When craft time is over, settle in on the couch with a stack of books. If you have a family that likes to make things, check out my book suggestions for a family of makers. 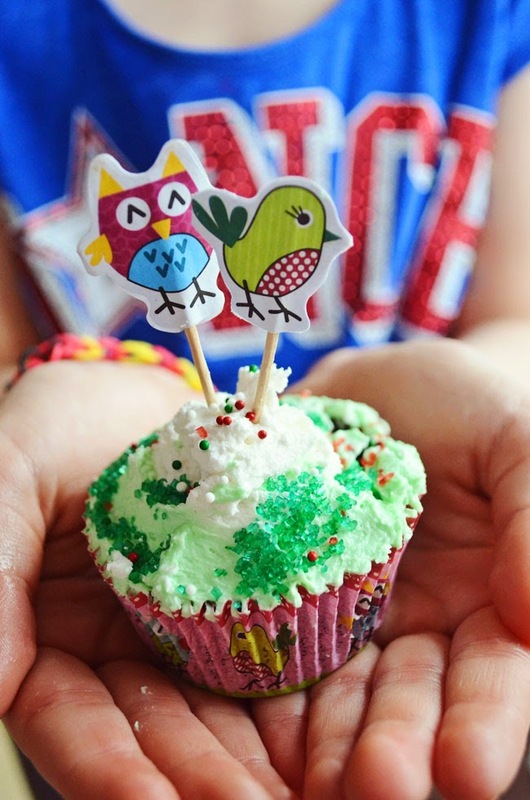 Vegan Mint Chocolate Brownie Cupcakes - each person can decorate their own cupcake as they wish. 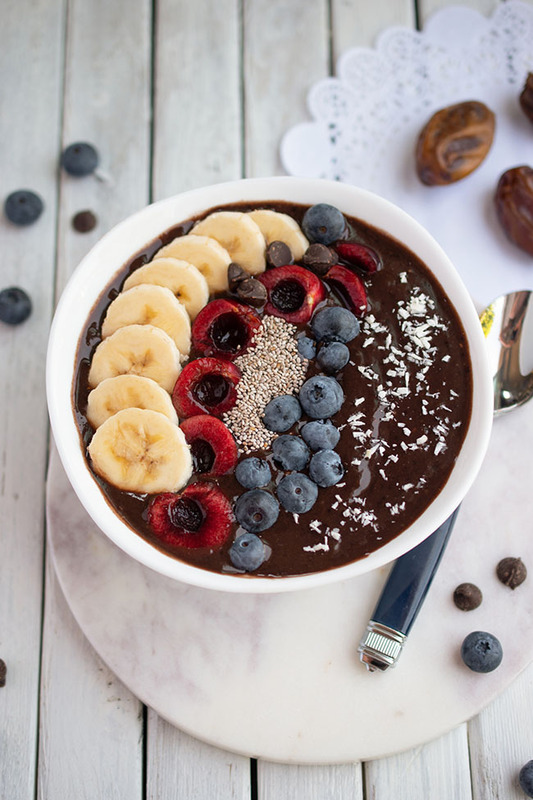 Quick and easy peanut butter and chocolate banana nice cream is a healthy, dairy-free alternative to ice cream that makes a great snack. These Cape Breton Cookies are healthy but still incredibly tasty, with a hint of molasses - a bit like gingerbread. Don't spend all day making cinnamon rolls. These Quick Vegan Spelt Cinnamon Rolls come together in a flash. Do you celebrate Family Day where you live? Will you head outdoors or snuggle in to watch movies, drink cocoa and do crafts? A bit of both maybe? Thank you for this fun collection of projects and including some of ours. I'm usually scrambling on holidays to entertain the kids, or I just let them fend for themselves (typically tears, theirs and mine, ensue). Will be more organized for their next day off and try some of these ideas :) . Wow - what a collection of activities. That should keep everyone entertained. Thanks for sharing.